Invasive species are one of the greatest threats to global biodiversity. Eradication of most invasive fishes is rarely feasible. However, reducing the biomass of invasive species to keep them from getting a leg-up (so to speak) can be a lucrative alternative. Establishing commercial and recreational fisheries for invasive fishes can be a useful step in the fight against invasives. However, the trade in invasive species meat can be limited to niche markets, largely because many people can be turned off by the stigma of eating an “undesirable” species, or simply because they don’t know how to prepare the meat. Well, my goal for this post is to show some of my favorite recipes for a few of the nastiest invasive fishes in the US, with hopes you’ll be putting a few more of the bad guys on the dinner table. Snakehead tacos. Native to China, Russia and Korea, the Northern snakehead has become one of the most hated invasive fishes on the east coast. Despite their ugly appearance, snakehead is actually a delicious firm and flaky meat. They are excellent when grilled, but I like them for tacos because they don’t fall apart like other fishes. Mix all ingredients and marinate for at least an hour. Cook in a very hot skillet for about 2 minutes. Best served sizzling with homemade corn tortillas, chopped white onion and fresh cilantro. Pecan encrusted catfish. Channel and Blue catfish are native throughout much of North America. 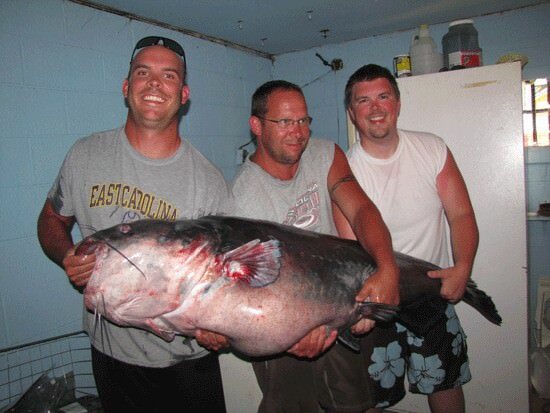 However, Channel catfish are considered nuisance species in several parts of Asia, and non-native Blue catfish are considered a major threat in mid-Atlantic tidal rivers. I like a good catfish fry just as much as anybody, but this recipe for baked catfish is a nice change from the heavy fried catfish you may be used to. Mix the pecans and bread crumbs, then dredge fillets in the mixture. Place fillets in lightly-oiled pan, and pour the remaining bread crumb mixture over the fillets. Bake at 400˚ for about 30 minutes, until pecans are well toasted. Serve with orange marmalade and baked asparagus. Smoked carp cakes. Native to the large rivers of the Asian mainland, Silver and Bighead carps are known for their high population sizes, amazing jumping abilities and high filter-feeding capacities. Because of this, Silver and Bighead carps are a major threat to fisheries throughout the Midwestern US. Smoke the fillets for at least an hour. Separate the meat from the bones (it can be pretty bony), splitting it into small pieces. Mix all ingredients in a bowl until homogeneous, then pat into cakes to your size of choice. Finish it off in a hot skillet. Best served with Cajun remoulade sauce. Previous Post Did animators know that two of three “Finding Nemo” sharks cannibalized their own siblings? Next Post Slate editor puts us in the likes with NPR and the Guardian!